Treasury of Philosophical Tenets (Tib. གྲུབ་མཐའ་མཛོད་, Drubta Dzö; Wyl. 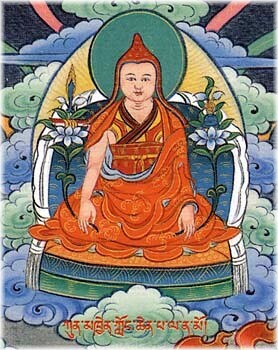 grub mtha' mdzod) - one of the Seven Treasuries of Longchenpa. How the Buddha came into this world (based on hinayana, mahayana, and tantric accounts); the twelve acts of the Buddha; the "turning the wheel of the Dharma". The Teachings; Shakyamuni's teachings, and the commentarial traditions. Philosophical Tenets, based upon these teachings, including: outsiders (non Buddhists) and insiders (Buddhists). The Buddhist views include: Vaibhashika, Sautrantika, Yogachara, and Madhyamika. The Way to progress on the Path (Wyl. lam bgrod tshul), including the approach of the Shravaka, Pratyekabuddha, and Bodhisattva, and an account of the five paths. An account of the secret mantrayana as the Fruition, including the special characteristics of Vajrayana. An account of How the Vajrayana Teachings Came About, including the New Tantra (Sarma) definitions, and classifications. An account of The Ancient Tradition (Nyingma) definitions and classifications, divided into three general tantras (kriya, upa, yoga), and three inner tantras (mahayoga, anuyoga, atiyoga). An account of the Esoteric Approach, being the Vajra Essence of Luminosity, including a general discussion of: How the ground of Being naturally abides; the way in which sentient beings go astray, the way in which sentient beings can practise, and then finally achieve the fruition of freedom. This page was last edited on 21 March 2011, at 03:34.